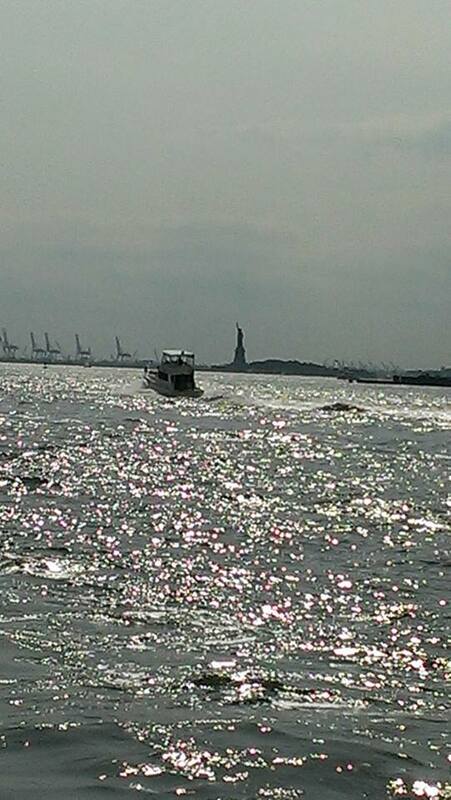 "Such an impressive sight, Dad, the Statue of Liberty!" said Brandon. "I'll bet the last time we were here, I was five years old." "I guess that's about right, Brandon," I moaned. "I dunno, I'm so damn nauseous!" "Oh, Dad, your impossible tendency to sea sickness! Why didn't you wear the patch?" 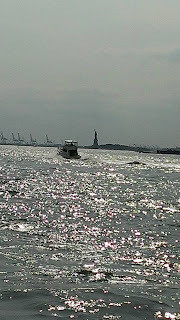 "Who'd think I'd need it for the boat ride to Liberty Island? Ooooohhhh, if only that big fat guy would stop eating that meat ball sandwich!" "Come on, Dad! This is a 20 minute boat ride. What about our ancestors who had to journey weeks and months by ship to get here?" "If I'd been one of our ancestors, Brandon," I gasped, pressure rising steadily in my esophagus, "right now you and I'd be speaking in some language with not enough vowels and that bright red Phillies cap you've got on? "Would probably get us shot!" Fortunately we live today in a land where freedom means you don't get shot for wearing a Philadelphia Phillies baseball cap, even if you're in New York City. That's not exactly what the Statue of Liberty truly symbolizes, but it's a secondary theme I guess in this, my weekly contribution to the fabulous flying Friday Fictioneers. I won't comment on the word count on my post based on the picture prompt above except to say it's excessive, but excessive in the cause of freedom at least. I'm sure many of the other Fictioneers, whose works are available by clicking here, have hopefully curbed my enthusiasm for verbal excess. If you don't mind now, I'm gonna be sick! See you next week. sounds risky. a red cap and seasickness.. would it be a solution to puke in the cap? But you have birthday cake to eat soon! Happy birthday, Perry. Enjoyed your story. Shoot a man when he's nauseous? That's like shooting a man in the back! Oh, those Yankees fans! Thanks for writing, Janet. Thanks! I'm a little disappointed, though, that the fat guy is still eating the meat ball sub. Puke in a Phillies cap? Why that's sacrilegious! Oh, wait a minute, the Phillies have done that all this year. Well, I guess we can let you slide... just this once... after all, you did tell a good story. The Fabulous Flying Friday Fictioneers I like that, and may steal it. Your blog has new look since I was here last... I like it! Should I mention that when my young son got seasick when we went for weekend trips on our boat out of Newport, CA that I simply shoved - er, put - an anti-nausea medicaction up his, er.... YOU know. Point being: it worked every time. Might be food for thought. You are of an age where you could take care of the mechanics all on your own. You're correct that the reason I didn't get it, Russell, was because they were looking for someone younger, but Casey Stengel wasn't available or alive. So they opted for somebody else, I guess he's younger. If I made you feel like you wanted to puke while reading my story, I have been successful. Although many people have said they always feel like they want to puke while reading my stories. Thank you. That still doesn't quite do it, but it gives me at least some cred! Thank you, Ted! Three compliments is about all I can take in a day. Actually one usually is overpowering for me. I may be of an age where I'd rather have an attractive nurse do it. But if I'd only known of this earlier, I would have had much more fun on my boat out of Newport CA too! While I'm not prone to seasickness, the meatball sub caused my gorge to rise. As for extra words, it's your birthday. Take a few out of petty cash and have a great day! I don't know what's funnier, the story or the comments! Well done, as always. Frequently I make me want to throw up, so you're in bad company, Ron. I just missed the prompt for some reason last week which spared everyone another neurotic aging angst laden story. A libertine? Is that a cracker made expressly for liberals? See, that joke would make anyone throw up! Can I take a few dollars out instead? Thanks, Rochelle! I think they both cancel each other out, which makes neither of them funny. Thanks, Jan! Forgot to say HAPPY BIRTDAY!!! and, good news, at 70 Social Security also covers your incontinence supplies! Just had to read your story this week as we share a birthday! Great story, well except for the visual I got about getting sick. Ugh. Other than that pretty darn good! Have a great day. Belated Happy Birthday wishes, Perry. Fun story. Poor guy...my dad was prone to sea sickness, but went ocean fishing with hi step,dad every summer. That's dedication. Fun story and your excessive word count is your prerogative on your birthday! I have to say, Perry, that your depiction of the trip was so good it made me feel queasy. Well done. I think. Lol - probably right! My dad would shoot me if I had on a Philly's cap. This is a cute story! A meatball sandwich would make me sick on or off a boat. I gather you just had a birthday. See, I'm quick. Happy Belated Birthday! Actually at my age social security kicks in at 42. And barf bags are included! Thank you, but frankly I think it's kind of nauseating! If I get seasick enough I'd welcome someone to shoot me! Maybe some moondust could help me? Thank you. But GET AWAY FROM ME WITH THOSE SPIDERS!!! Hope you had a great day too. C'mon just chug the whole beer, you'll thank me for it! Fun for you, maybe, I'm sick as a dog here! What a fine son your dad was! And what a jerky dad your granddad was! I realized I first had a problem when I got sick playing with toy boats in the bathtub. To this day, I don't ever do it anymore! Thanks, Erin. Making someone sick to their stomach is kind of my specialty, and I am very proud that I was able to sicken you as well. Ahh, it's a great birthday! Thanks, Linda. If you're starting to feel sick, just stare into that lime jello ocean! People in Philadelphia this year might do the same! I'd rather not gather it frankly. You could be even less quick! Thanks, Amy. I guess I must have had ancestors a bit more rugged than I am or ancestors with an unlimited supply of dramamine. Thanks for putting one of my character's on board. That is Uncle Frank'c nephew eating the meatball sandwich, isn't it? Thank you, Linda. That is indeed Uncle Frank'c (sic) nephew eating the meatball sub, but what's in the meatball sub is indeed sic! Thanks, Doug. Don't need to visit anywhere to know that engendering nausea in others is my best thing going. At least it makes an impact, pro or con. That meatball sub was making me a little nauseous just reading about it. Happy birthday Perry!